Michele Rocca (Michele da Parma), Italian painter. In 1682 Rocca journeyed to Rome, where he was a pupil of Ciro Ferri, returning for further study to Parma, where he concentrated on pictures by Correggio. He was documented as being in Parma in 1687 but had returned to Rome by 1695, when he executed the altar of St Francis Receiving the Stigmata for S Paolino alla Regola (in situ). In 1698 he received payment for an altarpiece of the Penitent Magdalene for S Maria Maddalena, Rome (in situ). In 1710 Rocca was elected to the Congregazione dei Virtuosi al Pantheon, and in approximately the same year he executed two of his best-known paintings: the Toilet of Venus (Providence, Rhode Island School of Design Museum of Art) and the Finding of Moses (University of Chicago, Smart Museum of Art). These are among the finest of the small-scale, semi-precious cabinet pictures of mythological and hagiographical subjects that dominate Rocca s oeuvre and gained for him the reputation of being a petit maître in early 18th-century Rome. Their decorative rarity, luminous pigmentation and rich painterly effects betray the fundamentally sensual nature of Rocca s style and clearly suggest that his artistic vision was in some ways more closely aligned with the emerging French Rococo than with the neo-Baroque style of his contemporary Roman colleagues. 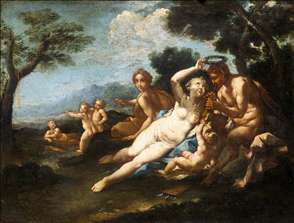 See more details about "Satyr Crowned by a Nymph"